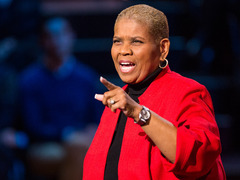 Rita Pierson: Every kid needs a champion In this talk, Pierson shares the secret to teaching students, especially those from disadvantaged backgrounds — make personal connections with them. This text is an adaptation of the first chapter in The Courage to Teach: Exploring the Inner Landscape of a Teacher’s Life (Jossey-Bass, 2007) by Parker J. Palmer. I am a teacher at heart, and there are moments in the classroom when I can hardly hold the joy. When my students and I discover uncharted territory to explore, when the pathway out of a thicket opens up before us, when our experience is illumined by the lightning-life of the mind—then teaching is the finest work I know. But at other moments, the classroom is so lifeless or painful or confused—and I am so powerless to do anything about it that my claim to be a teacher seems a transparent sham. Then the enemy is everywhere: in those students from some alien planet, in that subject I thought I knew, and in the personal pathology that keeps me earning my living this way. What a fool I was to imagine that I had mastered this occult art—harder to divine than tea leaves and impossible for mortals to do even passably well! Are you an educator wanting to apply Courage to Teach in your work? Courage to Teach programs, based on Parker J. Palmer’s approach, can help you cultivate your capacity to teach wholeheartedly—as your true self. Find a Courage to Teach program for you! If students and subjects accounted for all the complexities of teaching, our standard ways of coping would do—keep up with our fields as best we can, and learn enough techniques to stay ahead of the student psyche. But there is another reason for these complexities: we teach who we are.Teaching, like any truly human activity, emerges from one’s inwardness, for better or worse. As I teach, I project the condition of my soul onto my students, my subject, and our way of being together. The entanglements I experience in the classroom are often no more or less than the convolutions of my inner life. Viewed from this angle, teaching holds a mirror to the soul. If I am willing to look in that mirror, and not run from what I see, I have a chance to gain self-knowledge—and knowing myself is as crucial to good teaching as knowing my students and my subject. In fact, knowing my students and my subject depends heavily on self-knowledge. When I do not know myself, I cannot know who my students are. I will see them through a glass darkly, in the shadows of my unexamined life—and when I cannot see them clearly I cannot teach them well. When I do not know myself, I cannot know my subject—not at the deepest levels of embodied, personal meaning. I will know it only abstractly, from a distance, a congeries of concepts as far removed from the world as I am from personal truth. We need to open a new frontier in our exploration of good teaching: the inner landscape of a teacher’s life. To chart that landscape fully, three important paths must be taken—intellectual, emotional, and spiritual—and none can be ignored. Reduce teaching to intellect and it becomes a cold abstraction; reduce it to emotions and it becomes narcissistic; reduce it to the spiritual and it loses its anchor to the world. Intellect, emotion, and spirit depend on each other for wholeness. They are interwoven in the human self and in education at its best, and we need to interweave them in our pedagogical discourse as well. By intellectual I mean the way we think about teaching and learning the form and content of our concepts of how people know and learn, of the nature of our students and our subjects. By emotional I mean the way we and our students feel as we teach and learn feelings that can either enlarge or diminish the exchange between us. By spiritual I mean the diverse ways we answer the heart’s longing to be connected with the largeness of life—a longing that animates love and work, especially the work called teaching. After three decades of trying to learn my craft, every class comes down to this: my students and I, face to face, engaged in an ancient and exacting exchange called education. The techniques I have mastered do not disappear, but neither do they suffice. Face to face with my students, only one resource is at my immediate command: my identity, my selfhood, my sense of this “I” who teaches—without which I have no sense of the “Thou” who learns.Here is a secret hidden in plain sight: good teaching cannot be reduced to technique; good teaching comes from the identity and integrity of the teacher. In every class I teach, my ability to connect with my students, and to connect them with the subject, depends less on the methods I use than on the degree to which I know and trust my selfhood—and am willing to make it available and vulnerable in the service of learning. One student I heard about said she could not describe her good teachers because they were so different from each other. But she could describe her bad teachers because they were all the same: “Their words float somewhere in front of their faces, like the balloon speech in cartoons.” With one remarkable image she said it all. Bad teachers distance themselves from the subject they are teaching—and, in the process, from their students. If good teaching cannot be reduced to technique, I no longer need suffer the pain of having my peculiar gift as a teacher crammed into the Procrustean bed of someone else’s method and the standards prescribed by it. That pain is felt throughout education today as we insist upon the method du jour—leaving people who teach differently feeling devalued, forcing them to measure up to norms not their own. The capacity for connectedness manifests itself in diverse and wondrous ways—as many ways as there are forms of personal identity. Two great teachers stand out from my own undergraduate experience. They differed radically from each other in technique, but both were gifted at connecting students, teacher, and subject in a community of learning. This scenario more or less repeated itself a second time, but by the third time we met, our high SAT scores had kicked in, and we realized that the big dollars we were paying for this education would be wasted if we did not get with the program. So we started doing the reading, making comments, asking questions—and our teacher proved herself to be a brilliant interlocutor, co-researcher, and guide in the midst of confusions, a “weaver” of connectedness in her own interactive and inimitable way. But the drama of my mentor’s lectures went farther still. He would make a strong Marxist statement, and we would transcribe it in our notebooks as if it were holy writ. Then a puzzled look would pass over his face. He would pause, step to one side, turn and look back at the space he had just exited—and argue with his own statement from an Hegelian point of view! This was not an artificial device but a genuine expression of the intellectual drama that continually occupied this teacher’s mind and heart. These two great teachers were polar opposites in substance and in style. But both created the connectedness, the community, that is essential to teaching and learning. They did so by trusting and teaching from true self, from the identity and integrity that is the source of all good work—and by employing quite different techniques that allowed them to reveal rather than conceal who they were. Their genius as teachers, and their profound gifts to me, would have been diminished and destroyed had their practice been forced into the Procrustean bed of the method of the moment. The proper place for technique is not to subdue subjectivity, not to mask and distance the self from the work, but—as one grows in self-knowledge—to help bring forth and amplify the gifts of self on which good work depends. Are you committed to living the undivided life, to bringing your whole self to the classroom and becoming a better teacher? Courage to Teach programs can help you do just that. The claim that good teaching comes from the identity and integrity of the teacher might sound like a truism, and a pious one at that: good teaching comes from good people. But by “identity” and “integrity” I do not mean only our noble features, or the good deeds we do, or the brave faces we wear to conceal our confusions and complexities. Identity and integrity have as much to do with our shadows and limits, our wounds and fears, as with our strengths and potentials. By identity I mean an evolving nexus where all the forces that constitute my life converge in the mystery of self: my genetic makeup, the nature of the man and woman who gave me life, the culture in which I was raised, people who have sustained me and people who have done me harm, the good and ill I have done to others, and to myself, the experience of love and suffering—and much, much more. In the midst of that complex field, identity is a moving intersection of the inner and outer forces that make me who I am, converging in the irreducible mystery of being human. By integrity I mean whatever wholeness I am able to find within that nexus as its vectors form and re-form the pattern of my life. Integrity requires that I discern what is integral to my selfhood, what fits and what does not—and that I choose life-giving ways of relating to the forces that converge within me: do I welcome them or fear them, embrace them or reject them, move with them or against them? By choosing integrity, I become more whole, but wholeness does not mean perfection. It means becoming more real by acknowledging the whole of who I am. Those are my definitions—but try as I may to refine them, they always come out too pat. Identity and integrity can never be fully named or known by anyone, including the person who bears them. They constitute that familiar strangeness we take with us to the grave, elusive realities that can be caught only occasionally out of the comer of the eye. Stories are the best way to portray realities of this sort, so here is a tale of two teachers—a tale based on people I have known, whose lives tell me more about the subtleties of identity and integrity than any theory could. Catapulted from his rural community into an elite private college at age 18, Eric suffered severe culture shock—and never overcame it. He was insecure with fellow students and, later, with academic colleagues who came from backgrounds he saw as more “cultured” than his own. He learned to speak and act like an intellectual, but he always felt fraudulent among people who were, in his eyes, to the manor born. But insecurity neither altered Eric’s course nor drew him into self-reflection. Instead, he bullied his way into professional life on the theory that the best defense is a good offense. He made pronouncements rather than probes. He listened for weaknesses rather than strengths in what other people said. He argued with anyone about anything—and responded with veiled contempt to whatever was said in return. In the classroom, Eric was critical and judgmental, quick to put down the “stupid question,” adept at trapping students with trick questions of his own, then merciless in mocking wrong answers. He seemed driven by a need to inflict upon his students the same wound that academic life had inflicted upon him—the wound of being embarrassed by some essential part of one’s self. But when Eric went home to his workbench and lost himself in craft, he found himself as well. He became warm and welcoming, at home in the world and glad to extend hospitality to others. Reconnected with his roots, centered in his true self, he was able to reclaim a quiet and confident core—which he quickly lost as soon as he returned to campus. Watching Alan teach, you felt that you were watching a craftsman at work—and if you knew his history, you understood that this feeling was more than metaphor. In his lectures, every move Alan made was informed by attention to detail and respect for the materials at hand; he connected ideas with the precision of dovetail joinery and finished the job with a polished summary. Alan taught from an undivided self—the integral state of being that is central to good teaching. In the undivided self, every major thread of one’s life experience is honored, creating a weave of such coherence and strength that it can hold students and subject as well as self. Such a self, inwardly integrated, is able to make the outward connections on which good teaching depends. If Eric had not been alienated as an undergraduate—or if his alienation had led to self-reflection instead of self-defense—it is possible that he, like Alan, could have found integrity in his academic vocation, could have woven the major strands of his identity into his work. But part of the mystery of selfhood is the fact that one size does not fit all: what is integral to one person lacks integrity for another. Throughout his life, there were persistent clues that academia was not a life-giving choice for Eric, not a context in which his true self could emerge healthy and whole, not a vocation integral to his unique nature. The self is not infinitely elastic—it has potentials and it has limits. If the work we do lacks integrity for us, then we, the work, and the people we do it with will suffer. Alan’s self was enlarged by his academic vocation, and the work he did was a joy to behold. Eric’s self was diminished by his encounter with academia, and choosing a different vocation might have been his only way to recover integrity lost. As good teachers weave the fabric that joins them with students and subjects, the heart is the loom on which the threads are tied: the tension is held, the shuttle flies, and the fabric is stretched tight. Small wonder, then, that teaching tugs at the heart, opens the heart, even breaks the heart—and the more one loves teaching, the more heartbreaking it can be.We became teachers for reasons of the heart, animated by a passion for some subject and for helping people to learn. But many of us lose heart as the years of teaching go by. How can we take heart in teaching once more, so we can do what good teachers always do—give heart to our students? The COURAGE TO TEACH® is the courage to keep one’s heart open in those very moments when the heart is asked to hold more than it is able, so that teacher and students and subject can be woven into the fabric of community that learning, and living, require. We lose heart, in part, because teaching is a daily exercise in vulnerability. I need not reveal personal secrets to feel naked in front of a class. I need only parse a sentence or work a proof on the board while my students doze off or pass notes. No matter how technical or abstract my subject may be, the things I teach are things I care about—and what I care about helps define my selfhood. To reduce our vulnerability, we disconnect from students, from subjects, and even from ourselves. We build a wall between inner truth and outer performance, and we play-act the teacher’s part. Our words, spoken at remove from our hearts, become “the balloon speech in cartoons,” and we become caricatures of ourselves. We distance ourselves from students and subject to minimize the danger—forgetting that distance makes life more dangerous still by isolating the self. I did not know whether to laugh or cry—but I knew that my response would have considerable impact on a young man who had just opened himself to ridicule. I told him that not only could he use the word “I”, but I hoped he would use it freely and often. Then I asked what had led to his question. That is why we train doctors to repair the body but not to honor the spirit; clergy to be CEOs but not spiritual guides; teachers to master techniques but not to engage their students’ hearts—or their own. That is why our students are cynical about the efficacy of an education that transforms the inner landscape of their lives: when academic culture dismisses inner truth and pays homage only to the objective world, students as well as teachers lose heart. The Courage to Teach builds on a simple premise: good teaching cannot be reduced to technique but is rooted in the identity and integrity of the teacher. Good teachers are authentically present in the classroom and are able to weave a complex web of connections between themselves, their subjects, and their students, helping their students weave a world for themselves. What does that look like? Recovering the heart to teach requires us to reclaim our relationship with the teacher within. This teacher is one whom we knew when we were children but lost touch with as we grew into adulthood, a teacher who continually invites me to honor my true self—not my ego or expectations or image or role, but the self I am when all the externals are stripped away.By inner teacher, I do not mean “conscience” or “superego,” moral arbiter or internalized judge. In fact, conscience, as it is commonly understood, can get us into deep vocational trouble. When we listen primarily for what we “ought” to be doing with our lives, we may find ourselves hounded by external expectations that can distort our identity and integrity. There is much that I “ought” to be doing by some abstract moral calculus. But is it my vocation? Am I gifted and called to do it? Is this particular “ought” a place of intersection between my inner self and the outer world, or is it someone else’s image of how my life should look? When I follow only the oughts, I may find myself doing work that is ethically laudable but that is not mine to do. A vocation that is not mine, no matter how externally valued, does violence to the self—in the precise sense that it violates my identity and integrity on behalf of some abstract norm. When I violate myself, I invariably end up violating the people I work with. How many teachers inflict their own pain on their students—the pain that comes from doing a work that never was, or no longer is, their true work? The teacher within is not the voice of conscience but of identity and integrity. It speaks not of what ought to be, but of what is real for us, of what is true. It says things like, “This is what fits you and this is what doesn’t.” This is who you are and this is who you are not.” “This is what gives you life and this is what kills your spirit—or makes you wish you were dead.” The teacher within stands guard at the gate of selfhood, warding off whatever insults our integrity and welcoming whatever affirms it. The voice of the inward teacher reminds me of my potentials and limits as I negotiate the force field of my life. We can, and do, make education an exclusively outward enterprise, forcing students to memorize and repeat facts without ever appealing to their inner truth—and we get predictable results: many students never want to read a challenging book or think a creative thought once they get out of school. The kind of teaching that transforms people does not happen if the student’s inward teacher is ignored. That phrase, of course, is one we normally use to name a symptom of mental imbalance—a clear sign of how our culture regards the idea of an inner voice! But people who learn to talk to themselves may soon delight in the discovery that the teacher within is the sanest conversation partner they have ever had. Authority comes as I reclaim my identity and integrity, remembering my selfhood and my sense of vocation. Then teaching can come from the depths of my own truth—and the truth that is within my students has a chance to respond in kind. My concern for the “inner landscape” of teaching may seem indulgent, even irrelevant, at a time when many teachers are struggling simply to survive. Wouldn’t it be more practical, I am sometimes asked, to offer tips, tricks, and techniques for staying alive in the classroom, things that ordinary teachers can use in everyday life?I have worked with countless teachers, and many of them have confirmed my own experience: as important as methods may be, the most practical thing we can achieve in any kind of work is insight into what is happening inside us as we do it. The more familiar we are with our inner terrain, the more sure-footed our teaching—and living—becomes. Technique is what teachers use until the real teacher arrives, and we need to find as many ways as possible to help that teacher show up. But if we want to develop the identity and integrity that good teaching requires, we must do something alien to academic culture: we must talk to each other about our inner lives—risky stuff in a profession that fears the personal and seeks safety in the technical, the distant, the abstract. The house soon divided along predictable lines. On one side were the scholars, insisting that the subject is primary and must never be compromised for the sake of the students’ lives. On the other side were the student-centered folks, insisting that the lives of students must always come first even if it means that the subject gets short-changed. The more vigorously these camps promoted their polarized ideas, the more antagonistic they became—and the less they learned about pedagogy or about themselves. How this might be done is a subject I have explored in earlier essays in Change, so I will not repeat myself here. In “Good Talk About Good Teaching,” I examined some of the key elements necessary for an institution to host non-compulsory, non-invasive opportunities for faculty to help themselves and each other grow inwardly as teachers. In “Divided No More: A Movement Approach to Educational Reform,” I explored things we can do on our own when institutions are resistant or hostile to the inner agenda. Our task is to create enough safe spaces and trusting relationships within the academic workplace—hedged about by appropriate structural protections—that more of us will be able to tell the truth about our own struggles and joys as teachers in ways that befriend the soul and give it room to grow. Not all spaces can be safe, not all relationships trustworthy, but we can surely develop more of them than we now have so that an increase of honesty and healing can happen within us and among us—for our own sake, the sake of our teaching, and the sake of our students. Honesty and healing sometimes happen quite simply, thanks to the alchemical powers of the human soul. When 1, with 30 years of teaching experience, speak openly about the fact that I still approach each new class with trepidation, younger faculty tell me that this makes their own fears seem more natural—and thus easier to transcend—and a rich dialogue about the teacher’s selfhood often ensues. We do not discuss techniques for “fear management,” if such exist. Instead, we meet as fellow travelers and offer encouragement to each other in this demanding but deeply rewarding journey across the inner landscape of education—calling each other back to the identity and integrity that animate all good work, not least the work called teaching. Learn more about Courage & Renewal programs for teachers. “Good Talk About Good Teaching: Improving Teaching Through Conversation and Community” appeared in the November/December 1993 issue of Change. A revised version appears as Chapter VI in The COURAGE TO TEACH®. “Divided No More: A Movement Approach to Educational Reform” appeared in the March/April 1992 issue of Change.A revised version appears as Chapter VII in The COURAGE TO TEACH®.